In this chapter we shall discuss some of the major classical techniques and conventions that were invented over the centuries to mathematically describe and measure physical phenomena. Many are still applied and referred to by theoretical physicists and pure mathematicians, as we shall discover throughout this treatise. Ancient Egyptian land surveyors first developed the practical rules of space measurement and geometry by trial and error. Then, about 300 BCE, Greek scholar Euclid formalized the empirical concepts of geometry (based primarily on points, straight lines, triangles, and circles) into a system of mathematical axioms in order to measure land and construct buildings. It became known as “Euclidean Geometry” (Goldberg, pp. 7 – 9). 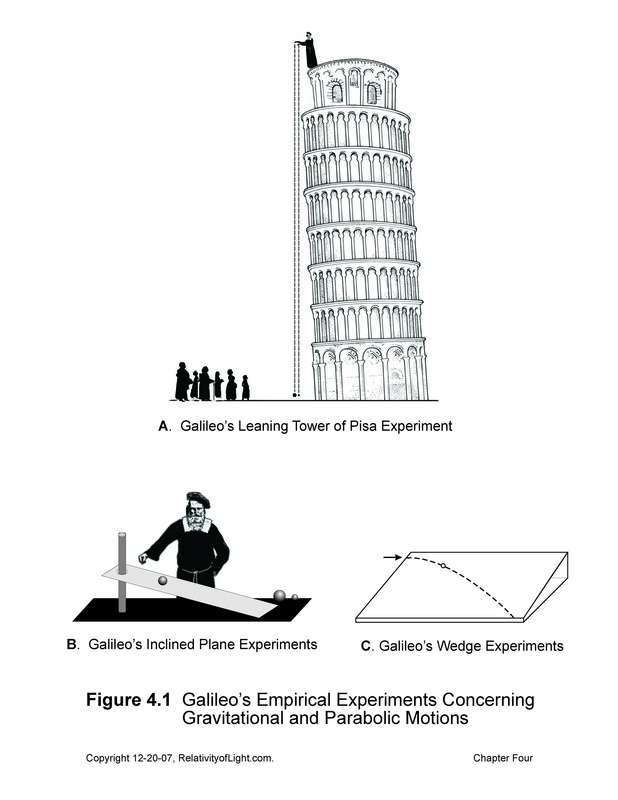 Another reason for such measurements was to determine the position of a material object or a physical event (i.e. a battle) in order to locate and describe it with precision. Newton faced the theoretical problem of describing positions and motions of material objects in empty space where there was no stationary body or place of reference. How could he physically or mathematically describe the position of a material body, its uniform inertial motion, its accelerated motions, its velocity or its trajectory, without some fixed place or point of reference? Newton’s solution of expediency was to merely postulate an immovable place of reference, “absolute space,” which theoretically was absolutely at rest (Chapter 2). Unfortunately, this artificial solution caused many theoretical problems for physics during the next three centuries. During the early 17th century, French philosopher René Descartes (1596 – 1650) devised a simple system to abstractly describe and illustrate on a piece of paper the position of a point or an event in space. He used a grid of rectilinear intersecting lines. Each line on the grid was assigned a different number, and the point where any two lines intersected was called a “coordinate.” (see Figure 3.1A). The origin or zero point on the grid played the part of a body of reference. It was the point of reference to which all coordinates referred (Goldberg, p. 73). Cartesian coordinates can be used to measure two-dimensional distances between two points on a plane (i.e. on a football field), usually by means of the Pythagorean Theorem (Figure 3.1A). 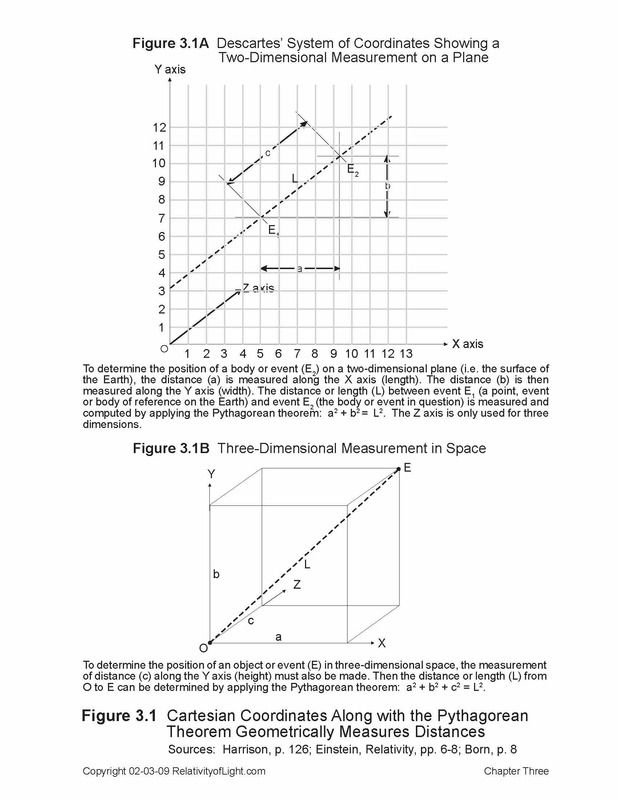 Likewise, Cartesian coordinates can be used to measure three-dimensional distances in space by determining the magnitudes of the three spatial coordinate axes (x, y, and z) relative to the zero point, and then computing the distance from the zero point to the material object or physical event (P), again by means of the Pythagorean Theorem (Einstein, Relativity, pp. 6 – 9; see Figure 3.1B). When the origin (zero point) of a coordinate system is theoretically connected to the eyes of a fictional observer, then the coordinate system can mathematically be called the “frame of reference for such observer (Young, p. 78). According to mathematical theory, every observer in the universe has an imaginary system of Cartesian coordinates (with a set of x, y, z axes) rigidly attached to his eyes. This fiction of a personal coordinate system theoretically enables the observer to geometrically determine the position and distance of any other body or event in space relative to his eyes (Ibid). Unfortunately, the term frame of reference (or reference frame) is often used indiscriminately and interchangeably to mean several very different things. For example, it can mean a system of coordinates, the visual perspective of a human observer, a distant object that the observer or measurer is referring to for measurements, or something with a unique or specific velocity. In Special Relativity, a frame of reference is the mathematical representation of a material body of reference in motion with a specific velocity, which moving body can contain an infinite number of spatially separated observers or measurers, each with his own clock. All of these different meanings can become very confusing. How can we graphically illustrate the motion of a material point or body on a system of coordinates? First, we must determine the successive positions of the body at successive specified times (Born, pp. 16 – 17). To do this, we must change the x-axis of the coordinate system to represent the distance (d) traveled by the body, and we must change its y-axis to represent an interval of time elapsed (t) (Ibid, p. 18). We then plot each successive position of the moving body as a point for each successive interval of time. By connecting the points a line is created which represents and illustrates the motion of the moving body. 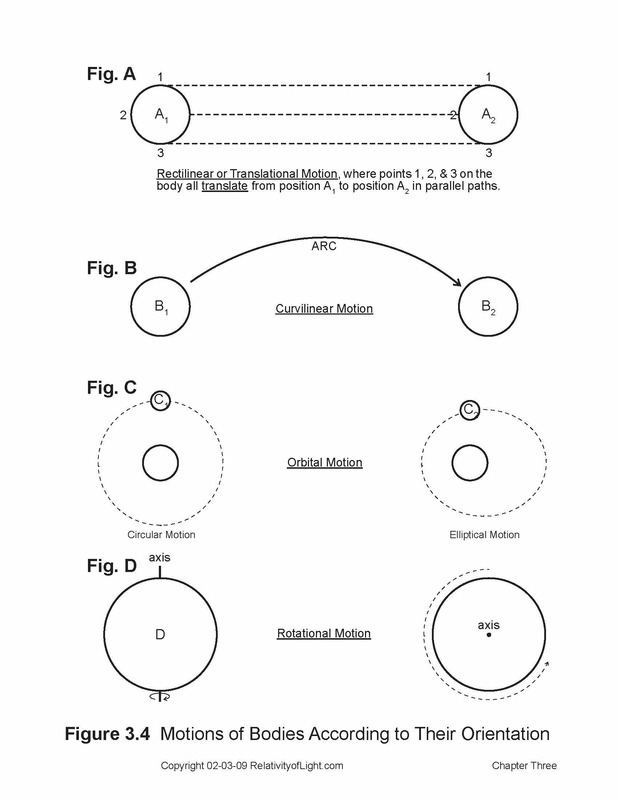 In this way we can abstractly illustrate various different types of motion (Ibid, pp. 16 – 17; Figure 3.2). Coordinate systems can be used to analyze the motions of matter in the abstract or with regard to their causes; in other words, by kinematics or dynamics. “Kinematics” is the study of abstract geometrical motions of bodies, without consideration of their causes (i.e. a force). “Dynamics” is the study of motion with regard to its causes, i.e. the magnitudes of force, mass, and time which result in the acceleration, velocity, or momentum of a body (Folsing, p. 178). The motions of bodies may be characterized by their magnitudes (Memo 3.3). The “speed” of a body is the rate of its motion…the distance a body moves from one position to another, divided by the time elapsed. The “velocity” of a body (or a ray of light) expresses its speed in a certain direction (Goldberg, p. 33). When the rate of speed of an object is uniform or constant and in the same rectilinear direction, this can be called a ‘uniform rectilinear velocity’ (Figure 3.2B). A uniform rectilinear velocity may result from a continuous force, such as where a locomotive is needed to propel a train down a straight track at a constant speed in order to overcome friction and the Earth’s force of gravity. However, in empty space, far from gravity and friction, this continuous application of force is not necessary to maintain a substantially uniform rectilinear velocity. This type of uniform rectilinear velocity of a celestial or other body in space (without the application of force) is known as ‘inertial’ motion ( Figure 4.1A). Because Special Relativity is based upon “inertial motion” (with or without the application of force), inertial motion will become very important for our later discussions. When either the rate of the speed or the direction (orientation) of a body’s uniform velocity is changed (vis., by another force), this changed motion is known as “acceleration.” Accelerations may be “uniform,” such as a train uniformly increasing its speed down a straight track (Figure 3.2C), or the uniform circular orbit of a body (Figure 3.4C1), or the constantly increasing gravitational acceleration of a body falling toward Earth (Figure 4.1B). Accelerations may also be varied or arbitrary, such as the herky-jerky motions of a roller coaster (Figure 3.2D). 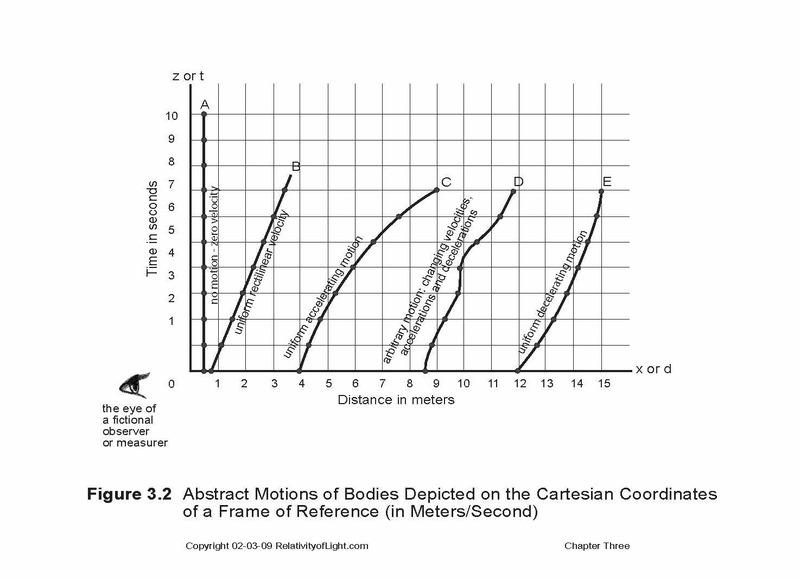 Motions of bodies may also be characterized by their orientations-their directions of motion. For example, “rectilinear” or “translational” motion is where a body moves or “translates” in a straight line from one position to another (Figure 3.4A). “Curvilinear” motion is where a body moves from one position to another in an arc (Figure 3.4B). “Orbital” motion is where one body moves around another body in a circular, elliptical or arbitrary path (Figure 3.4C). “Rotational” motion is where all points on a body rotate or revolve around the body’s own axis (Figure 3.4D). 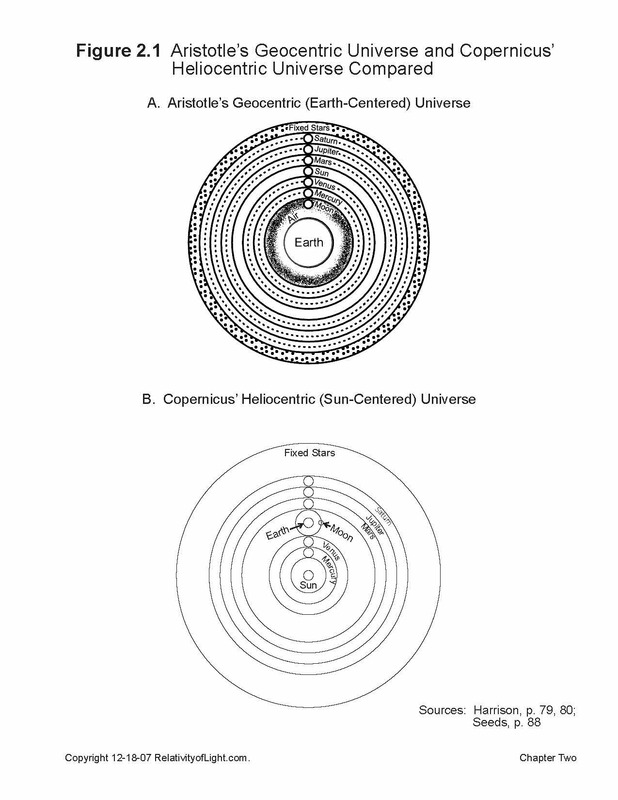 The motion of the Earth through space exhibits a combination of all of the above described motions, orientations and trajectories at the same time: relative to its own axis, and relative to other planets, the Moon, the Sun, other stars, the core of the Milky Way Galaxy, and other galaxies. What is a trajectory? It is usually described as the path of a moving object, such as a baseball in flight. The trajectory of an object may be more specifically described as the continuance over space and during time of the three-dimensional coordinate positions of such object as perceived or measured by an observer. The trajectory of any moving terrestrial body will appear to be different for each observer, depending upon such observer’s unique position and visual perspective relative to such moving body. For example, a baseball slugger views the curved trajectory of his home run ball to be in a rectilinear orientation relative to his unique position and visual perspective in the stadium (Figure 3.5A). When other observers choose different unique positions in the stadium, their visual perspectives, their mental perceptions and their frames of reference concerning the trajectory of the home run ball will necessarily be quite different (Figures 3.5B, 3.5C and 3.5D). Does this mean that the physical laws of motion for the ball, during its flight from the batter to the bleachers, are different for each individual observer? Of course not. There is only one motion of the baseball, and this motion does not vary because of different observers watching or measuring it. 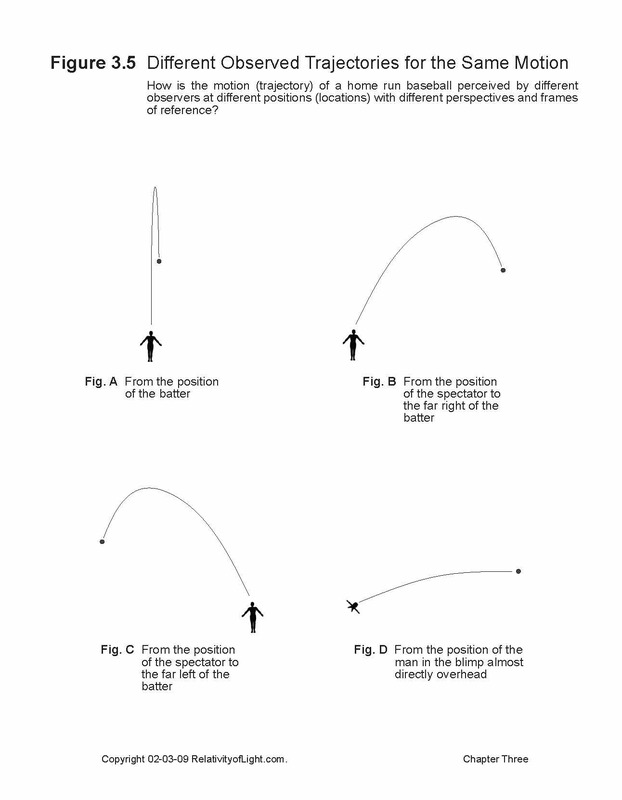 Only each observer’s unique visual perspective, perception and coordinate description of such motion (its trajectory relative to the observer’s eyes and his unique position) varies (Rohrlich, pp. 20 – 21). These simple concepts and facts will become critical when we consider and analyze Special Relativity in Part II of this treatise. Why? Because Einstein claimed ad hoc that his dubious methods of measurement from one moving body to or from another distant moving body caused the length of a meter rod to become shorter or contracted (possibly to zero length) on the distant moving body, and also caused the duration of the time intervals on such distant moving body to shorten (possibly to zero duration) (Figure 3.8 and Chapters 26 & 28) Later Einstein even claimed that such dubious perceptions and measurements caused the magnitude of the mass of the distant moving body to increase (possibly to infinity) (see Chapter 31). Now let us return to the discussion of perspectives, perceptions, and trajectories. What if the observers are also moving relative to the trajectory of the moving baseball? Each moving observer at different changing positions relative to the moving baseball merely has different visual perspectives, different changing perceptions and different coordinate descriptions of the same event…the same motion of the baseball (Rohrlich, p. 20). Algebraic equations that mathematically relate two different coordinate descriptions of the same (or an identical) event are called “transformation equations” (Goldberg, p. 74). The different coordinate descriptions of the same event that we have been discussing obviously result from the different visual perspectives and perceptions of various observers or the same moving observer. On the other hand, some different coordinate descriptions that we will later discuss in Special Relativity result from Einstein’s creation of distorted transformation equations and Einstein’s misapplication of such distorted transformation equations to physical phenomena. “The stone traverses a straight line relative to a system of co-ordinates rigidly attached to the carriage, but relative to a system of co-ordinates rigidly attached to the ground (embankment) it describes a parabola.With the aid of this example it is clearly seen that there is no such thing as an independently existing trajectory (lit. “path-curve”) but only a trajectory relative to a particular body of reference” (Einstein, Relativity, p. 11; Figure 3.7). The falling stone in Einstein’s above description is merely an example of the stone’s combined inertial motion and gravitational fall in a parabolic motion (Figure 4.1), expressed in terms of each observer’s different visual perspectives, perceptions and Descartes’ coordinates. The so-called “straight line” vertical coordinate trajectory described in Einstein’s above example is best referred to as an illusion. As rationalized by Born, the “stone falls…along a vertical [path] that is moving with the [carriage] (Born, p. 69). Why did Einstein describe this example of two different observers with different visual perspectives who perceive different trajectories for the same motion? It certainly could not have been for the reason that he suggested, because Einstein’s Special Theory has nothing to do with different perceived trajectories for the same motion. Einstein’s real reasons for describing the above example so early in his book Relativity were obviously quite different. His example attempts to establish certain mindsets for his readers with respect to his later Special Relativity concepts, analogies and rationalizations. 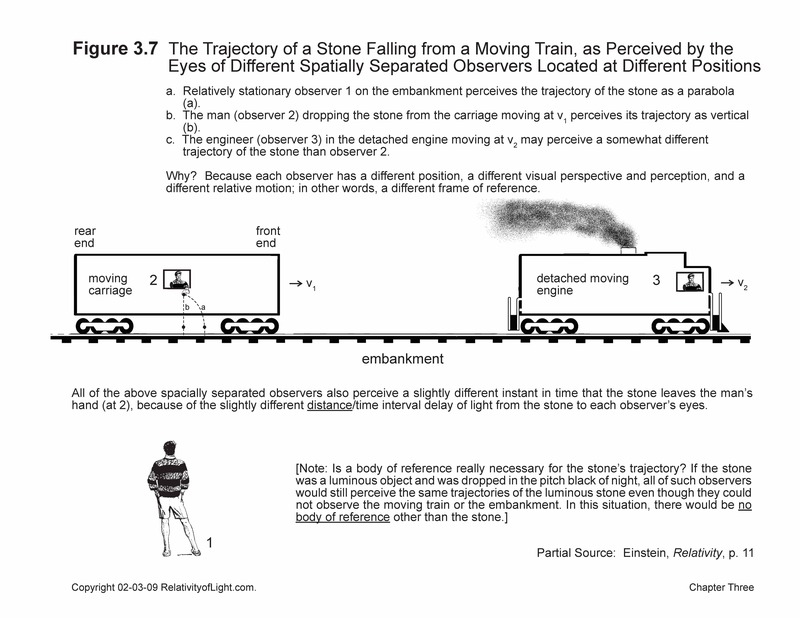 First of all, Einstein is suggesting that the relative motions (of the passenger on the train, the falling stone and the observer on the embankment) by themselves can affect each different observer’s perceptions, mathematical descriptions and coordinate measurements of the same event. Secondly, for his Special Theory, Einstein needed two different observers (measurers), each with a different uniform rectilinear relative motion and each with a different frame of reference (coordinate system). His above example provided all of these requirements. But above all, what Einstein specifically suggested with his above example was that different observers on different inertial bodies (i.e. observer No. 2 on the train and observer No. 1 on the Earth) with different inertial velocities can make different coordinate measurements of the same motion of an object entirely by reason of their relative velocity (Figure 3.7). In effect, Einstein’s above example was a preview of Special Relativity; an early artificial analogy that attempted to indoctrinate his readers with misleading ideas that might confuse them into believing that his later meaningless relativistic concepts, i.e. the Relativity of Length, were at least plausible. In Einstein’s relativistic concept (called the Relativity of Length), the engineer in the detached engine (which is moving at a different uniform velocity than the carriage) theoretically cannot simultaneously plot the time coordinates for the coordinate positions of the front of the carriage and of the rear of the carriage by the hand and eye method (Figure 3.7; Resnick, 1992, pp. 480 – 481). Therefore, the engineer must plot each time and position coordinate separately. According to Einstein, another reason for this physical inability is that the light from the rear of the carriage takes a longer time interval to reach the engineer’s eye than the light from the front of the carriage. Theoretically, these physical inabilities will cause mathematical measurement problems for Einstein. During the time interval between each plotting, the carriage and the engine will have changed their relative positions (because of their different velocities) so that the plotting of the second coordinate position will be different than if the engineer and the carriage were relatively at rest. Thus, claimed Einstein, the physical length of the carriage is entirely relative for the engineer and it depends upon the relative velocity of the two moving bodies (in other words, their reference frames) and the time interval between such coordinate measurements (Figure 3.8). Stated in a different way, the coordinate descriptions for the length of the carriage will be different for the engineer’s delayed visual coordinate estimates of length than for the observer on the carriage who physically measures its length with a rigid meter rod. 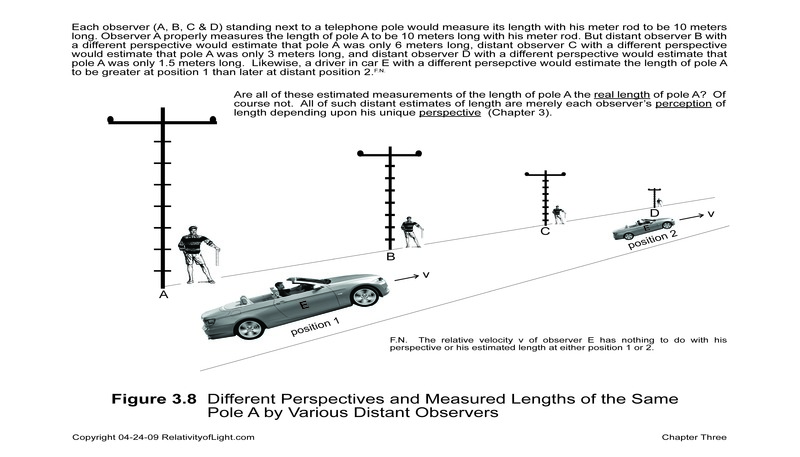 Therefore, there are two different coordinate descriptions and measurements for the length of the same moving object. Einstein’s artificial “solution” for this concocted mathematical problem of measurement was to relate such different coordinate measurements for the same event with his radical Lorentz transformation equations. The Lorentz transformation equations, in turn: 1) distorted Einstein’s inexact distant moving measurements so that they became mathematically identical to the measurements of the observer on the carriage, and 2) algebraically produced all of the bizarre mathematical consequences of Special Relativity, including the absolute velocity of light at c, length contraction, time dilation, increase in mass with velocity, etc., which Einstein needed for his Special Theory. “Technically, the whole of the special theory is contained in the Lorentz transformations” (Bertrand Russell, 1927, p. 29). It may be difficult for the reader to believe at this point in our story, but these theoretical and technical inabilities to make simultaneous mathematical coordinate measurements for both ends of a moving object in 1905 were the basic mathematical premise and rationalization for all of Einstein’s contrived relativistic theories of measurement (see Chapter 28). They were also the primary mathematical justification for his entire Special Theory. Why are we even discussing the ancient concepts of coordinates, frames of reference, transformation equations, relativity, and the like in this chapter? Because they are all man-made conventions that were invented during centuries past in order to physically and mathematically describe and understand the positions, motions, relationships and measurements of material bodies in space and during time. Antiquated as these mathematical conventions may be, they are all necessary for a basic understanding of Einstein’s Special Theory of Relativity as well as other theories and mathematical concepts that we will discuss in later chapters.